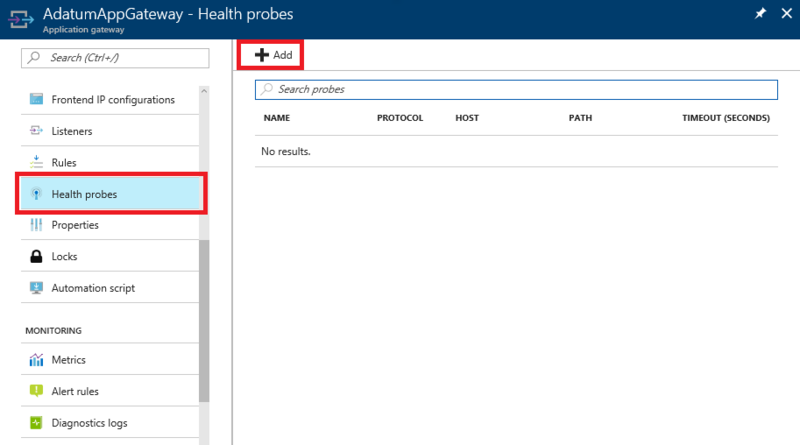 In this article, you add a custom probe to an existing application gateway through the Azure portal. Custom probes are useful for applications that have a specific health check page or for applications that do not provide a successful response on the default web application. If you do not already have an application gateway, visit Create an Application Gateway to create an application gateway to work with. Probes are configured in a two-step process through the portal. The first step is to create the probe. In the second step, you add the probe to the backend http settings of the application gateway. In the Azure portal Favorites pane, click All resources. Click the application gateway in the All resources blade. If the subscription you selected already has several resources in it, you can enter partners.contoso.net in the Filter by name… box to easily access the application gateway. Click Probes and click the Add button to add a probe. On the Add health probe blade, fill out the required information for the probe, and when complete click OK.
Name customProbe This value is a friendly name to the probe that is accessible in the portal. Protocol HTTP or HTTPS The protocol that the health probe uses. Host i.e contoso.com This value is the host name that is used for the probe. Applicable only when multi-site is configured on Application Gateway, otherwise use '127.0.0.1'. This value is different from the VM host name. Interval (secs) 30 How often the probe is run to check for health. It is not recommended to set the lower than 30 seconds. Timeout (secs) 30 The amount of time the probe waits before timing out. The timeout interval needs to be high enough that an http call can be made to ensure the backend health page is available. Unhealthy threshold 3 Number of failed attempts to be considered unhealthy. A threshold of 0 means that if a health check fails the back-end is determined unhealthy immediately. Now that the probe has been created, it is time to add it to the gateway. Probe settings are set on the backend http settings of the application gateway. Click HTTP settings on the application gateway, to bring up the configuration blade click the current backend http settings listed in the window. On the appGatewayBackEndHttpSettings settings blade, check the Use custom probe checkbox and choose the probe created in the Create the probe section on the Custom probe drop-down.. When complete, click Save and the settings are applied. The default probe checks the default access to the web application. Now that a custom probe has been created, the application gateway uses the custom path defined to monitor health for the backend servers. Based on the criteria that was defined, the application gateway checks the path specified in the probe. If the call to host:Port/path does not return an HTTP 200-399 status response, the server is taken out of rotation after the unhealthy threshold is reached. Probing continues on the unhealthy instance to determine when it becomes healthy again. Once the instance is added back to healthy server pool, traffic begins flowing to it again and probing to the instance continues at user specified interval as normal.